Turkey sought Thursday to reassure investors rattled by the crash of the Turkish lira, insisting the country would emerge stronger and has no need of an IMF bailout. 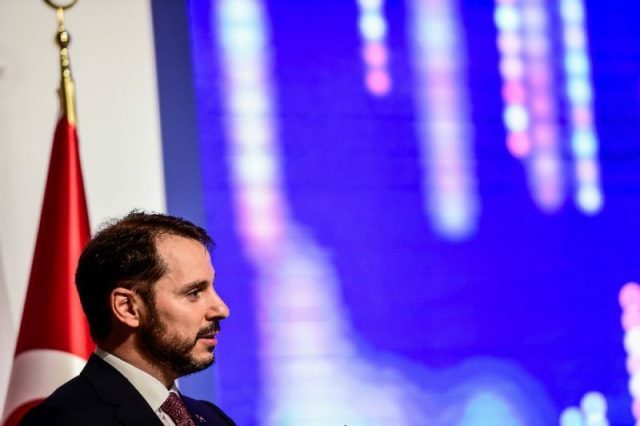 Finance Minister Berat Albayrak, the son-in-law of President Recep Tayyip Erdogan, addressed hundreds of foreign investors from the United States to Europe and Asia via a conference call in a bid to soothe the markets as tensions with the United States continue to escalate. The lira has over the last two days clawed back some ground — after losing almost a quarter of its value on Friday and Monday — but economists are warning Turkey must urgently address its economic imbalances to avoid more troubles ahead. “Turkey will emerge stronger from these (currency) fluctuations,” Albayrak was quoted by state-run TRT television as saying during the conference call. Albayrak rejected any idea of seeking a bailout from the IMF, an option never seen as likely given Erdogan has always proudly boasted of paying off Turkey’s past IMF debts in May 2013. “There is no IMF plan, we have focused on attracting direct investments,” said Albayrak. The lira, which earlier this week traded at well over 7 to the dollar, held onto its gains during Albayrak’s discussion, trading at 5.7 against the greenback. “We will turn this crisis into an opportunity,” said Erdogan’s spokesman Ibrahim Kalin after a cabinet meeting chaired by the president, saying measures taken so far had helped bring about a “rapid improvement process” over the last two days. But Albayrak, who was appointed last month in a largely unexpected move, faces a tough task in getting into order the economy which has been plagued by high inflation and a current account imbalance. The lira has been sliding for months, and it accelerated as a result of a diplomatic standoff with NATO ally the United States over the detention by Ankara of an American pastor that has snowballed into one of the worst crisis in bilateral ties in years. It turned into a rout last Friday when US President Donald Trump tweeted that his administration was doubling aluminium and steel tariffs for Turkey. The drop in the value of the lira will only fuel inflation, which is already near 16 percent. However, analysts say such measures are far from satisfactory and call for a sharp hike in interest rates — strongly opposed by Erdogan’s government which sees economic growth as its top priority. “So far, Turkey does not seem to be changing its policies fast enough,” Berenberg economist Holger Schmieding commented. In an escalating cycle of tensions with the United States, Erdogan has called for a boycott of US electronic goods such as the iPhone and Ankara has sharply hiked tariffs on some US products, a move called “regrettable” by the White House. He has shown no little willingness to compromise and vowed to emerge victorious from the “economic attack” while slamming the lira crash as a “political plot”. He has also warned Ankara could start looking for new allies, new markets after its partnership with Washington may be in jeopardy. Qatar, backed by Erdogan during the Saudi-led embargoes on the emirate in 2017, on Wednesday pledged to channel $15 billion direct investment into Turkey, a sign of burgeoning ties between the two countries. Analysts say Turkey is also likely to seek a more dynamic economic relationship with China and Russia, with whom ties have warmed considerably in recent years. Turkey has also in recent days shown appetite to repair ties with Europe after a crisis sparked by Ankara’s crackdown on alleged plotters of the 2016 failed coup. Erdogan and his French counterpart Emmanuel Macron agreed in a phone call Thursday to foster trade ties, a Turkish presidential source said. Albayrak on Thursday spoke with his German counterpart Olaf Scholz on the phone, where the two ministers agreed to “take steps in order to reinforce economic cooperation,” Albayrak’s office said. There have also been in the last days unexpected moves in key legal cases that have been bones of contention with Brussels, although Ankara always insists the judiciary is independent of politics. An Istanbul court allowed the release of Amnesty International’s Turkey chair Taner Kilic Wednesday, who spent more than a year in jail over alleged links to the 2016 coup bid. And the day earlier, two Greek soldiers held by Turkey since March for illegally crossing the border were also freed.